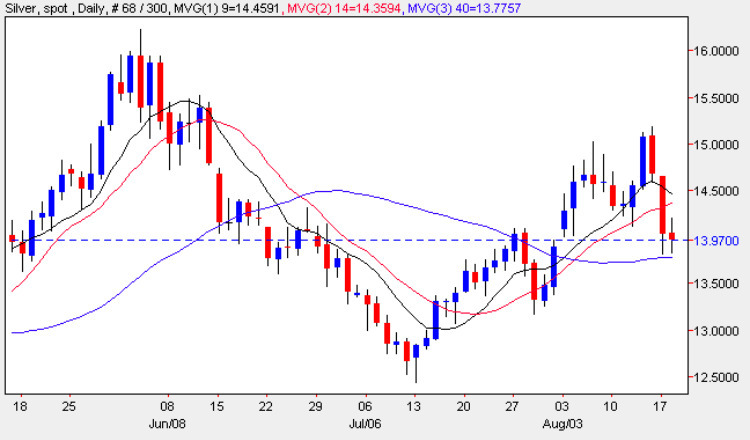 Unlike spot gold, spot silver failed to bounce but rather ended the silver trading session with a small long legged doji which has several interesting characteristics which could suggest a minor reversal higher tomorrow. The first point of note is that the low of the day found support from the 40 day moving average which replicated Monday’s price action on the silver chart suggesting that we are seeing some support from the moving average at this price level. Secondly the two candles created have formed a neat tweezer bottom formation which whilst only minor, may also suggest a small rise in silver prices. Finally the doji candle is generally indicative of a market about to turn and this may provide us with a short term silver trading opportunity to the long side.